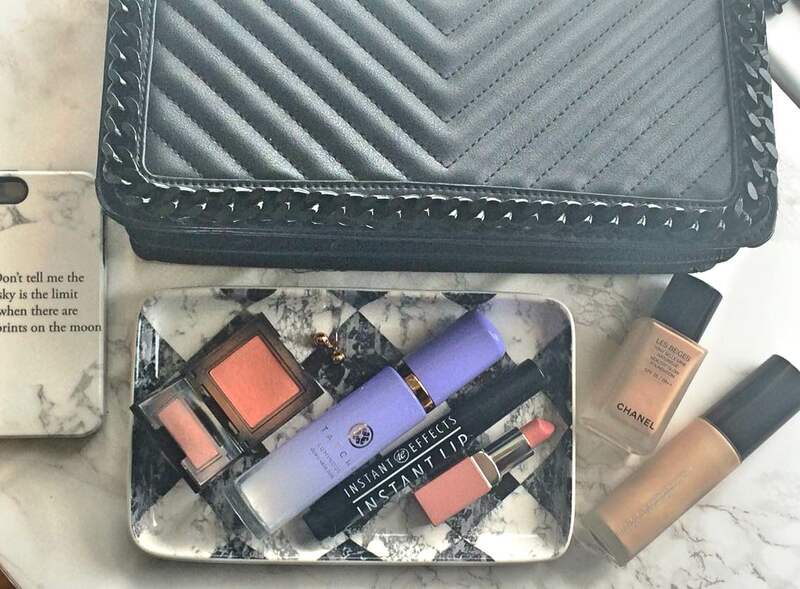 April favourites featuring Laura Mercier, Chanel, Tatcha, Instant Effects, bloggers & more! It is the end of April but as I write this, it is snowing! Yes, snow in April but that's Irish weather for you! I hope you've all had a great month? I am very excited for May because at the end of the month, we are going on holiday! Today I'm sharing my favourites in beauty but also some accessories & bloggers that I've been really enjoying! I was lucky enough to be contacted by Caseapp recently who introduced me to their range of phone cases and laptop skins, all of which can be custom designed. My old phone case was looking a little worse for wear so the timing couldn't have been better! I had a look on their website and was really pleasantly surprised by the range of designs available. There are custom iPhone cases, but also cases for Samsung and skins for Nokias, HTC phones, iPods, MacBooks and regular laptops. I decided to go for an extra tough protection case for my iPhone 5s because my nieces and nephews like to play with my phone, which can sometimes lead to it being dropped so it needs extra protection. You first choose which phone/laptop you have, then you decide if you would like to use one of their designs - ranging from marble to city images to animal print, food, flowers, palms trees, beach pictures and so many more or your own images. There are both glossy and matte finishes available and then you can further customise the case by adding your own text or choosing from a selection of quotes/images/flags. You can basically make the perfect phone case or laptop skin for you or your loved one. Delivery is available worldwide and it took one week for the product to reach me. My phone feels very secure, looks very pretty and it doesn't feel too bulky. I'm really delighted with my case but I am even more delighted that Caseapp have given me the a discount code to share with all of you and on top of that, a free phone case or laptop skin of your choice for one of my readers! If you would like to purchase a new phone case or laptop skin, you can avail of a 20% discount by using the code BEAUTYLYM20 at the checkout. The products are very reasonably priced so a 20% discount makes them very affordable - check out the full range here. Now on to the giveaway! The rules for the giveaway are pretty straightforward! 3. You must follow Caseapp on Twitter. 4. You must follow Beautylymin on Instagram. 5. You must follow Caseapp on Instagram. 6. You must tweet the giveaway message. 7. You must leave a comment with your usernames for Bloglovin/Twitter/Instagram. You can earn extra entries by leaving a comment telling me which design you would choose and whether you would choose a phone case or laptop skin and you can also earn extra entries by leaving a relevant comment on any of my other posts. If you don't follow steps 1-7, your entry will not be valid and will be deleted. If you follow and then unfollow, your entry will not be valid. This giveaway is open worldwide & the prize will be provided by Caseapp. The giveaway will end at midnight on May 18th and a winner will be chosen via random.org. I will then contact the winner and they will have 72 hours to respond. If the winner fails to respond within that timeframe, they will be disqualified and another winner will be chosen with the same criteria. If you are under 16, you will need a parent or guardian's permission to enter as you will have to disclose your address. I cannot be held responsible for anything lost in the post or any customs/fees incurred. 10 under €10 - budget beauty you need to try featuring Dove, Nivea, L'Oreal, Maybelline & more! I feature a lot of high end beauty products on the blog but I do also love a good bargain & there are some budget beauty products that I always have in my collection. I have previously posted 20 brilliant beauty products under €20 but today I thought I would go one further and post about 10 beauty products that are priced at less than €10 and should be in your collection. I have linked to a lot of the products on the Boots website but I am not sponsored or affiliated with them, it is purely for convenience if you want to buy any of the products. Let's get started! Today I want to share my initial thoughts on some recent purchases with you. Some of these products have been in my life for 4/5 weeks and others for only around 2 weeks, hence this being an initial thoughts post rather than full on reviews. 1. I am a palette addict & have enough eye shadows to last me a lifetime! 2. I am trying to be more mindful with my spending this year, so I'm "shopping my stash" more. 3. I have been going through my collection looking for Spring-appropriate products. 4. I'm doing my bi-annual make-up cull so had to decide if I wanted to keep these palettes & would actually wear them. All of the palettes mentioned here today, are ones that I really lusted after and was delighted to finally own, but for some reason were over-looked for newer palettes or ones that I already own. Some have barely been swatched, but there is no way that I can part with any of them because I do actually really love them so I'm going to make myself use them. Somebody needs to tell the weather that it is actually meant to Spring! Last weekend, we had hail and on Monday, the rain was so heavy that I had a (muddy) swimming pool in my garden! Anyway, in the hope that the weather decides to catch up with the season, I thought that I would share with you my top 5 nail polishes for Spring. I've put away all of my berry toned nail polishes and am ready to embrace the pastel shades in my collection! Last year, I was hauling regularly but this year, I have cut back quite a bit for a number of reasons - I have so many products in my collection that weren't being used (hence the rediscoveries posts), I am trying to be more mindful with my spending and (probably the main reason! ), I am going to America at the end of next month so I am saving to have a big splurge in Sephora! Rather than just jumping on all of the latest releases, I am only buying products that genuinely excite me/I have wanted for a while/I have run out of. Today, I have products that fill all of those criteria, so let's get started! Pixi Glow Tonic: This is my favourite acid toner and I have raved about it several times on the blog so I won't waffle on for too long but I really love how soft and clear my skin is when I use this and no other acid toner is as effective as Glow Tonic on my skin. I am almost finished my current bottle so had to repurchase and this is probably my 6th/7th bottle, which speaks volumes about how much I love this product. I have sensitive skin but it doesn't cause any redness or adverse reaction so I would recommend it if you have similar skin issues to me. Pixi Hydrating Milky Mist: This is another repurchase as I recently finished a bottle and again, I love it. I use this after Glow Tonic to add some hydration to my skin. Unlike some facial mists, this actually does hydrate the skin as it contains hyaluronic acid and the benefits can be felt immediately. I like the fact that it is a small bottle so it is perfect for in your handbag for hydration top-ups during the day. DIOR Addict Lip Glow Liner: This is a limited edition liner and, to be fair, is probably a bit of a Princess product but I really wanted it and it is limited edition. I bought it during the Escentual sale when it was reduced by 25% so that made me feel a little less guilty about buying it. It is supposed to boost the natural colour of the lips and therefore, be suitable for use with all lipstick and lip gloss colours. I will give it a go and report back to you on those claims! DIOR Addict Lip Glow Lip Balm: This is a product that I have had my eye on for a few years but never actually got around to buying because I couldn't justify the price for a lip balm, albeit one in the prettiest packaging! I have read so many positive reviews on this product that I knew I would have to bite the bullet at some point and buy it, but so many sites exclude Dior from their sales, but Escentual don't so I bought it using the 25% discount code. It comes in 3 shades - Coral, Lilac and Original, which is the one I chose because I am likely to use this on a daily basis and would prefer a natural lip colour. Again, I will report back to you with my thoughts on this when I have been using it for a while. So that's it - a short & sweet haul! Have you tried any of these products? I'd love to hear your thoughts in the comments below! I'd also love to hear what you've bought recently and if you're a spender or a saver? Empties & speedy reviews #23 featuring Pixi, Estée Lauder, Clarins Sarah Chapman, Nivea, Perricone MD & more! Every time my "empties bag" is full, I am really surprised that I've finished so many products again. I used to have half-full bottles and tubes scattered around my bathroom and bedroom because I just moved on to new products! I'm a changed woman (kinda!). I also love doing these posts so that I can refer back to them to check my thoughts on products if I am looking to change my routine up. I have a good variety of products here today, so let's get started! My evening pamper routine featuring Jo Malone, Oskia, Sarah Chapman, Xen Tan, Guerlain & more! I've been feeling pretty poorly since last weekend due to having a nasty bout of the norovirus and I was feeling really grotty so last night, I decided that I needed a good pamper. I took out my favourite products & spoiled myself and I really feel much better for it so today, I am going to share my pamper routine with you. I picked out my favourite and most luxurious products because I knew I had to bring out the big guns due to how rubbish I felt. My Granda always said that I was very fond of myself - I guess he was right? !